I find it interesting and often amusing when the inner contradictions of our thought and worldview create a social space in which those once thought to be opponents become allies. The BBC reported yesterday on the difficulty that Michele Bachmann is having with so-called “evangelical” Christians. You can listen to it between minutes 30:40 and 37:50 at: http://www.bbc.co.uk/iplayer/console/p00hj6t8. 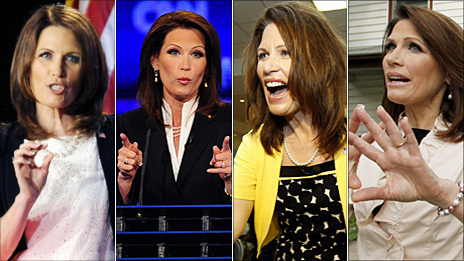 Although Bachmann defines herself as an “evangelical,” many of her fellow evangelicals do not support her candidacy for president of the United States simply because she is a woman. The Rev. Joan Brown Campbell, a Christian feminist, however, does support Bachmann’s candidacy – although she probably does not support Bachmann’s political agenda. The Rev. William Einwechter of a Free Reformed Baptist Church gave voice to many “evangelicals” who do not believe that women should be in positions of authority in their family, in their church, or in civil society. The basis for Einwechter’s belief is his particular interpretation of the Bible, which subordinates women to men because man was created first, because they interpret women as being portrayed as submissive and in a domestic context in Proverbs 31 and Titus 2, and because female leadership is depicted negatively in Isaiah 3:12. This is a particular interpretation as it does not identify the wife’s leadership in Proverbs 31, does not note positive examples of women in authority over men as in Judges 5, and struggles to reconcile to their proposal Paul’s statement “for just as woman came from man, so man comes through woman; but all things come from God” (1 Corinthians 11:12). Moreover, Einwechter’s appeal to the Bible for models of civil leadership is weak because he does not consider the historical context as a limitation and contribution to God’s particular act or word for that time, person and setting. Also, God’s commandments concerning government are given within the context of the covenanted people ofIsrael; other forms of government, of which women sometimes led, are accepted as God-ordained (Romans 13). The Rev. Joan Brown Campbell affirms Bachmann’s candidacy as a woman because she finds gender mutuality in Scripture. Brown Campbell filters Scripture through God’s love and directs all action toward the Last Judgment in which each will give an account for how they treated the least of “God’s children.” While I would agree with Brown Campbell’s egalitarian view of women in church and society, I would also question her Biblical interpretation, which seems to presuppose much of liberal humanism. But, if I had to choose between Brown Campbell and Einwechter, I would find myself much closer to Brown Campbell, and, to my surprise, allies, in this instance, with Bachmann – and other female leaders in society. John Calvin: In his commentary on 1 Timothy 2:11-13, he explains that it is improper to use the example of Deborah to argue for women holding public office given that such is against the “ordinary system of government” ordained by God and revealed in his Scriptures. This is Matthew Henry’s commentary on Proverbs 31:10-31. What are you seeing there that he and I don’t? Thank you Eddie for reading and interacting with the blog. I agree with you that Proverbs 31 does not speak about women holding public office. However, its picture of the ideal woman is one that does include leadership. She is buying and selling land, and she is creating cottage industry. I agree with Henry that the qualities of the woman in Proverbs 31 are centered on man. The context is about men finding “good” women and not women who impede men. I especially like Henry’s allegorical interpretation of the woman as the church. I think that is a beautiful image, and I also think that it subverts the gender and power dynamics. Your citations of Knox and Calvin, two theologians that I respect, reflect a particular interpretation that has to relegate the Scripture’s narrations of Deborah (Judges 4 and 5) and women who prophecy (Acts 21), but these great theologians still have to explain why God would choose to use women authoritatively. Also, Calvin’s “ordinary system of government” was not a democracy, and it is a bit of a leap to think that the forms of government “ordained” by God in Scripture can be equated with those that we have today. I am not against feminism, as you are – though I do have problems with the assumptions that undergird much of secular feminism. But I do not think that we, as Christians, need to introduce secular feminism into our hermeneutics. I think that Scripture already has the theology within its texts that speak to woman’s dignity and power. Anyway, I do want to post some writings on my thoughts on feminism in future blog posts. So, look for those, and we can interact some more. In this one, I just wanted to point out that it’s interesting to see that one who closer to Bachmann’s politics is against her public service, while one who probably doesn’t share Bachmann’s politics is supporting her candidacy.